In a project for Holloway Women’s Prison initiated by The British Museum and funded by UCL, Pharmacopoeia developed Dose – an installation documenting a woman’s ‘life’ up to 50 years as seen through her prescribed medication. Liz Lee spent time with the prison medical service at Holloway to gain insight into the health problems of this particular population. 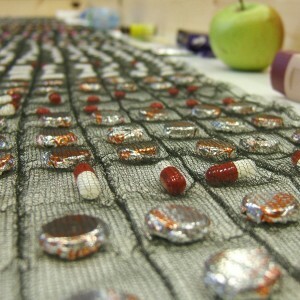 Similar to Cradle to Grave a pocket knitted pill narrative with health related objects, documents and family album photographs was made and exhibited in the prison chapel in autumn 2009. Pharmacopoeia ran art workshops to explore issues raised by Dose that were significant and resonant for women prisoners in Holloway such as addiction, sexual and mental health. Through group art making exercises the women developed their own ideas in a variety of media with a particular focus on textiles and making bags.